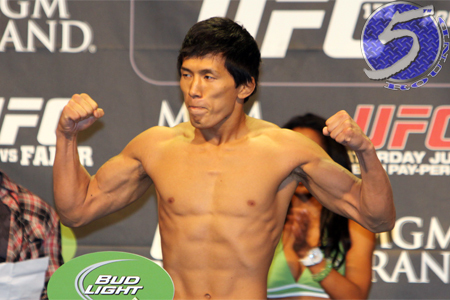 On Wednesday, a bantamweight affair between Takeya Mizugaki (pictured) and TJ Dillashaw was added to the UFC 173 roster. The May 24 event takes place inside MGM Grand Garden Arena in Las Vegas, Nevada. Mizugaki will quietly be riding a four-fight winning streak into the shootout. I say quiet because all of the victories during his current stretch have come via decision, half of which were of the split variety. Dillashaw has won five of his past six scraps. The Team Alpha Male product most recently posted a unanimous decision W over Mike Easton in January. No word on where the 135-pound affair will appear in the lineup. A middleweight title tilt between champion Chris Weidman and Vitor Belfort headlines the pay-per-view broadcast.